Samsung Galaxy A8 Plus features 16MP primary camera and 16+8MP front facing camera which makes it one of the best selfie smartphone. The primary camera supports with 30fps and has Dual Pixel OIS (Optical image Stabilization). The device comes with 6-inch (15.24 centimeters) Super AMOLED capacitive touchscreen with 2220 x 1080 pixels resolution and 16M color support. This smartphone runs on Android v7 Nougat OS with 2.2GHz + 1.6GHz Exynos 7885 octa-core processor. Also, to meet the other competitors, Samsung utilizes the latest trends of 6GB RAM, 64GB internal memory which can be expandable up to 256GB, and also with dual SIM (nano+nano) dual-standby (4G+4G) support. You will get Handset, USB Type C Cable, Earphones Tuned by AKG, Travel Adapter, Ejector Pin, Micro USB Connector (C to B), USB Connector (C to A), and also Quick Start and Smart Switch Leaflet in the purchased box. This device has Height: 299, Length: 630, Weight: 42, Width: 31 resolution and curved edges and comes with the Dual SIM which has Hybrid SIM Slots. It means either you can have two SIM cards or one SIM and one Memory card which is very common nowadays in the smartphones. The smartphones feature a large 6-inch Super AMOLED capacitive touchscreen which has 2220 x 1080 pixels resolution and 16M color support, also this is protected with Corning Gorilla Glass 5. 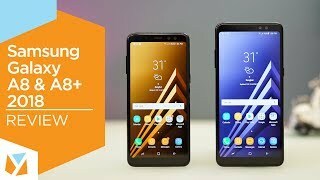 Samsung devices are among the very best in terms of overall performance, and the Galaxy A8+ is no exception. The phone is using an octa-core Exynos 7885 chipset which is coupled with huge 6GB RAM to make sure a smooth and lag-free mobile phone experience. You play games and use several apps simultaneously without any performance issues. The unit will not suffer any kind of lags at all, and users can get smooth and wonderful experience. 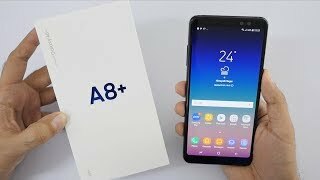 Samsung Galaxy A8 Plus contains non-removable Li-Ion 3,500mAh battery and Samsung claims it can last for an entire day. It also comes with fast charging support which will be useful for heavy users. Galaxy A8 Plus include connectivity options such as 4G, Wi-Fi 802.11 a/b/g/n/ac, NFC, GPS, and a USB Type-C port. The Samsung Galaxy A8 Plus is a great camera phone, especially for selfie lovers. The device sports a 16-megapixel primary camera and a dual 16+8-megapixel secondary shooter that properly aids photos and videos in both dark and bright conditions. And it does has Phase detection autofocus, OIS (Optical Image Stabilization) features which should be mandatory for this price range smartphones. OIS will stable images in low-light condition. And as we mentioned that this great selfie phone, it does support a wide-angle lens at front dual-camera for in-depth-selfies. 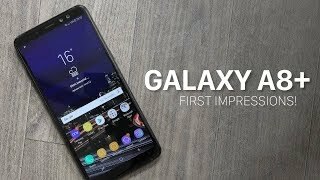 The lowest price of Samsung Galaxy A8+ (Black, 6GB RAM + 64GB Memory) was obtained on April 19, 2019 8:52 pm.